Purdue Engineering's Efficient Spectrum Usage Preeminent Team: From left, team members James Krogmeier, David Love and Nicolo Michelusi, all in the School of Electrical and Computer Engineering. 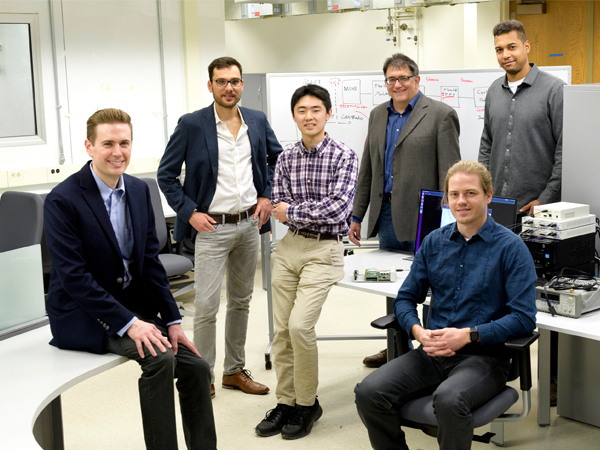 Engineering the 5G network for our wireless future Purdue engineers design ultrafast millimeter-wave networks for 5G mobile communications. Purdue engineers design ultrafast millimeter-wave networks for 5G mobile communications. When 5G wireless networks become commonplace, around 2020, they will deliver 100 megabit-per-second communications to ordinary smartphones, with peak speeds up to 10 gigabits per second — fast enough to download a full-length HD movie to a tablet in less than five seconds. Designed to meet the exploding demands for mobile data, 5G networks will bring high-end services not only to tablets and mobile phones but also to autonomous vehicles, medical devices, virtual reality training and working, and every last device that needs instant attention on the Internet of Things. “5G is using new technologies that can basically pump more bits-per-second through a given amount of spectrum, with networks designed in fundamentally different ways,” says David Love, professor of electrical and computer engineering at Purdue University. The 5G architecture will integrate many wireless technologies — most dramatically, new devices based on the millimeter-wave electromagnetic spectrum that was recently opened for commercial use in the United States. Wireless communications in this extremely high frequency range (30 to 300 GHz) employ relatively short-range, line-of-sight links using multiple antennas on each device and adapting to ever-changing local communication environments. The College of Engineering’s Efficient Spectrum Usage Preeminent Team, headed by Love, is working with experts outside Purdue to create a novel network architecture to provide these millimeter-wave broadband connections efficiently, seamlessly and relatively inexpensively in areas with many highly mobile devices. 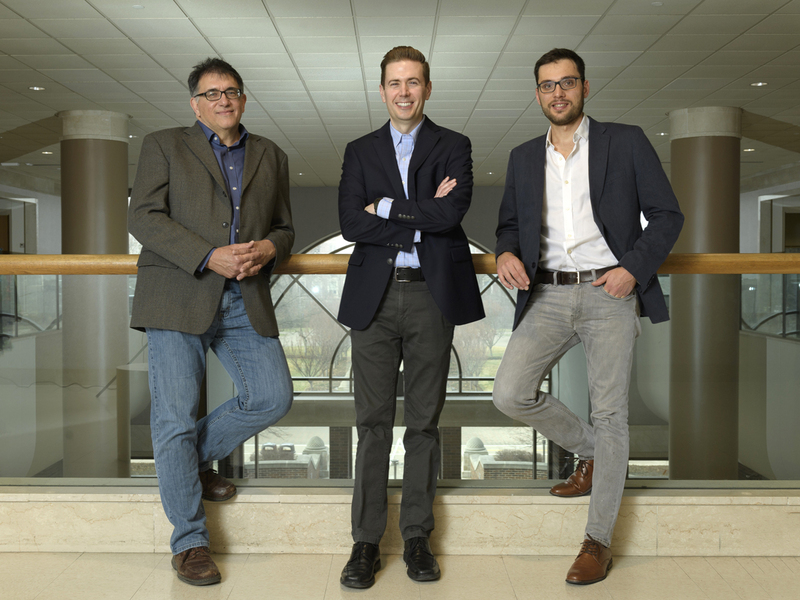 Under a three-year National Science Foundation grant, totaling $941,197 for the Purdue portion, the research combines theoretical and physical experimentation in the quest for practical millimeter-wave communications. Purdue University engineers seek to create the 5G network of the future. Nicolò Michelusi, principal investigator and assistant professor of electrical and computer engineering, explains. “Millimeter-wave systems use many antennas that are transmitting at the same time to basically design a focused beam with a very directed signal, almost like how you would point a laser,” Love says. 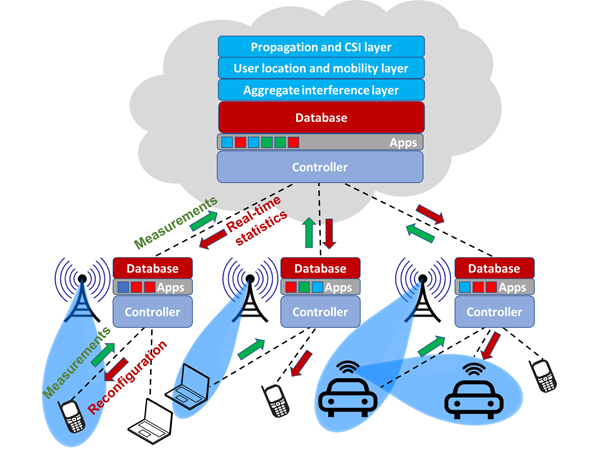 The millimeter-wave architecture envisioned by the Purdue team connects mobile devices with local base stations, which not only transmit and receive data but gather information about the density and movement of the devices and the local communications environment. The base stations then pass that information up to cloud computing services. “The cloud collects information about the environment and the base stations, processes the information, creates patterns of device movement and other communications characteristics, and then downloads the operating information on how base stations should communicate with the mobile devices,” Love says. “It has a much better view of the network than a single base station, so it can direct traffic to specific base stations and control the network in a much better way.” The result will be that the local devices can smoothly, constantly and efficiently adapt their transmissions to stay connected. All this communications processing must take place at extremely high speeds — high enough, for example, to seamlessly connect a mobile device in a car to the rapidly changing series of base stations that the car is passing. The cloud will track movements of the car and use information on its past movements to predict where the vehicle is heading, and then exploit those predictions to direct the flow of information to the mobile device. Millimeter-wave cloud-based architecture proposed by Purdue’s Efficient Spectrum Usage Preeminent Team. Solving such tricky technical problems demands a broad array of communications expertise. Among the Purdue preeminent team members working on the project, Michelusi is mathematically modeling how the transmission beams can best be aligned when they are working in a network with various forms of electromagnetic interference. “We then need to map these beam-forming techniques to a real-world scenario,” he says. Love is working on the physical layer of transmission — designing the waveforms that go out over the antenna and generate the transmission beams, and studying how these beams can be pointed and tracked in a network setting. Another co-principal investigator, James Krogmeier, professor of electrical and computer engineering, is simulating the networks in hardware designed to do rapid prototyping of wireless communications under control of a very-high-performance computer. This “software radio” test bed approach aided the preeminent team’s achievements in the U.S. Defense Advanced Research Project Agency's Spectral Challenge, which looked for radio protocols that delivered their traffic efficiently despite the presence of interfering signals. Project PI Nicolò Michelusi with PhD student Tomohiro Arakawa. The three Purdue investigators and their colleagues are joined by Christopher Anderson, an associate professor of electrical and computer engineering at the U. S. Naval Academy. Anderson is assembling a database of channel measurements for millimeter-wave signals — describing the characteristics of known signals going from transmitter to receiver. "We are bringing in diverse expertise to the project and working collaboratively to achieve our ambitious research goals,” Love says. 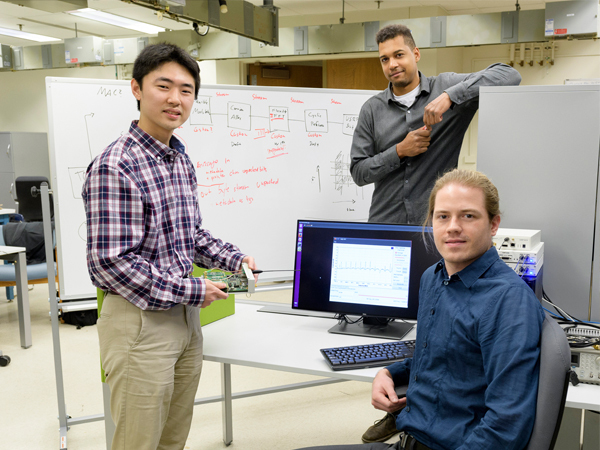 The team includes ECE PhD students Tomohiro Arakawa, Dennis Ogbe, and Stephen Larew (sitting). The big step to 5G services also will happen very quickly, as wireless firms struggle to meet enormous demand. So when people are instantly downloading HD movies, perhaps while traveling in self-driving cars, we'll know that Purdue engineers have done their part to optimize the networks necessary for the modern, wireless world. From left: David Love, professor of electrical and computer engineering and leader of the Efficient Spectrum Usage preeminent team; Nicolò Michelusi, assistant professor of electrical and computer engineering and project PI; Tomohiro Arakawa, PhD student; co-PI James Krogmeier, professor of electrical and computer engineering; Stephen Larew, PhD student (seated); and Dennis Ogbe, PhD student. Monthly global mobile data traffic will be 49 exabytes by 2021, and annual traffic will exceed half a zettabyte. Mobile will represent 20 percent of total IP traffic by 2021. The number of mobile-connected devices per capita will reach 1.5 by 2021. The average global mobile connection speed will surpass 20 Mbps by 2021. The total number of smartphones (including phablets) will be over 50 percent of global devices and connections by 2021. Smartphones will surpass four-fifths of mobile data traffic (86 percent) by 2021. By 2021, 5G will be 0.2 percent of connections (25 million), but 1.5 percent of total traffic. By 2021, a 5G connection will generate 4.7 times more traffic than the average 4G connection.